This toy is so simple to build, it goes together in 5 minutes from a few things found around the house. The toy is a high voltage motor that acts like a bell, with a clapper that bangs furiously from one can to the other and back again, sometimes several times per second. Occasionally, the big blue spark snaps between the cans, to add interest to frenetic activity. A plastic rod such as a ball-point pen. 5 inches of sewing thread. The photo may be all you need to get the toy working. Remove the pull-tops from both cans, and discard one of the pull-tops. Tie the thread to the other pull-top. Tape the other end of the thread to the center of the plastic rod. Place the two cans side-by-side two or three inches apart. Place the plastic rod on top of the two cans, so the pull-tab dangles freely about an inch from the table. Tape the bare end of one wire to the left can. This is the ground wire, and the free end should be connected to an electrical ground, such as a cold water pipe, or the metal frame of a computer. If a good electrical ground is not convenient, you can just hold onto the free end, since your body is a good enough ground for this device. Tape the other wire to the can on the right. It's free end will be connected to a source of high voltage. This is easier than it sounds, since a safe source of high voltage is right in front of you when you watch television or use a computer with a CRT monitor. In the photo above, you can see that the toy is sitting on top of a television. About two square feet of aluminum foil is pressed onto the face of the TV screen. It sticks there because the TV screen is highly charged with electricity. The free end of the right can's wire is attached to the aluminum foil. You start the toy by turning on the TV. The pull-top gets pulled to one can, but when it hits it, it gets pulled to the other can, and then repeats. Inside a CRT television, a high voltage is used to send electrons to the screen at high speed, to create the picture. By placing a large conductor on the front of the screen, we can make a capacitor, to tap into some of that high voltage and put it to use outside of the television. The voltage is high, but the current is very small, so that touching the foil or the toy is no more harmful than touching a doorknob after scuffing your feet on the carpet. These days, you might not find it easy to locate an old-fashioned CRT television. The motor will work great connected to a Van de Graaff generator, a Wimshurst machine, or the innards of a negative ion generator. The can on the right is connected to the high voltage. The can on the left is connected to the ground, which can absorb all of the voltage we can send it, and still be ready for more. The pull-tab and the can on the left starts out without any electrical charge. We say they are at "ground potential". The can on the right is charged with a lot of free electrons, from the foil on the TV screen. These electrons repel the electrons in the pull-tab, and attract the positive nuclei in the pull-tab. The electrons in the pull-tab move to the side farthest from the high voltage can on the right. This leaves the right side of the pull-tab more positive than the left side. The positive side of the pull-tab is attracted to the highly negative can on the right, and the pull-tab jumps over to touch the can on the right. Once it touches the can, the electrons from the can rush onto the pull-tab, until it has the same high voltage charge as the can it is touching. The pull-tab and the can now have the same charge, and like charges repel. The charged pull-tab is now repelled by the can on the right, and moves to the left. The electrons in the can on the left are repelled by the pull-tab, and they move to the left side of the can, leaving the right side somewhat positive. This positive side attracts the negatively charged pull-tab, and draws it up to touch the can. Now the excess electrons on the pull-tab move onto the left can, and into the ground. The pull-tab is now at ground potential again. It swings back towards the can on the right, and the whole process starts over again. The device we have just built is called "Franklin's Bells", after a description of the device given by Benjamin Franklin, who used it to detect the approach lightning storms. He connected one end to his lightning rod on top of the house, and the other end to an iron water pump well connected to the ground. Of course Ben didn't use soda cans. He used bells. I built a pretty version with bells and set it up on top of the TV just like our first version. I left the clappers on the bells, even though they no longer serve any purpose. The bells are connected to the aluminum foil and the ground by thin copper wires you can just barely see in the photo. 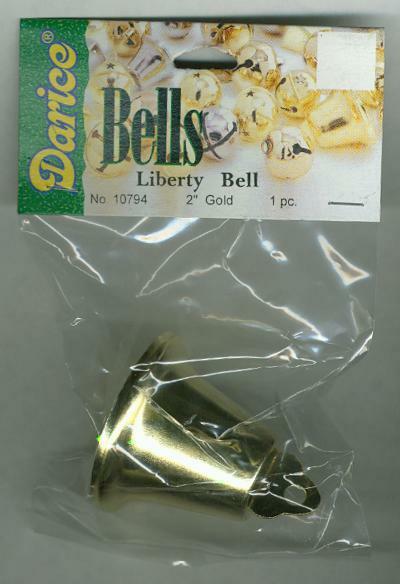 The bells are from a craft store. 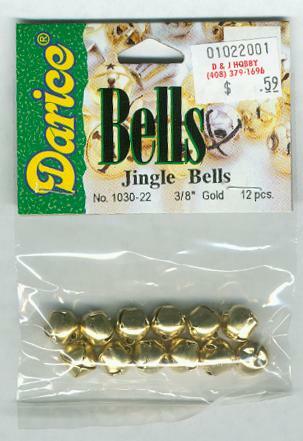 The clapper is one of the small round bells called "jingle bells".